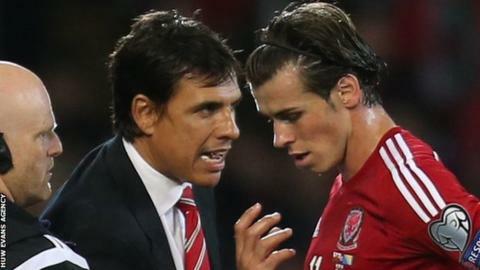 Manager Chris Coleman says Gareth Bale might miss one or both of Wales' two Euro 2016 warm-up games in March. Bale is back in training at Real Madrid after being sidelined for six weeks by a calf injury. Wales face Northern Ireland and Ukraine on 24 and 28 March respectively, but Coleman says Bale will only play if fit - and will be guided the Spanish club. "We will have to wait and see in the next week or two what happens," said Coleman. "And if he is not available, he is not available. He has had a bit of a time of it with Madrid, in terms of injury, a bit stop-start. "But Real Madrid have been so good with us in terms of how they have treated us. "They have been very respectful. They have never ever put an obstacle in our way, in terms of getting Gareth. "We need to repay that compliment. If he has not had enough game time and he needs to have more time there then so be it." If Bale is available then Coleman may limit his game time to aid his rehabilitation from his third calf injury this season. Coleman will soon start fresh contract talks with the Football Association of Wales. Speaking at a conference for Euro 2016 finalists in Paris, he added: "I think after his experience last year when he was heavily criticised - certainly at one stage of the season, unfairly criticised - he came through that. "Mentally he is very tough and basically it is about making sure he is 100% fit." The Wales manager will lead Wales into a Euro 2016 group involving England, Russia and Slovakia and is looking on the bright side on Bale's time on the sidelines. "It's the same with Wayne Rooney, who has been injured. If we are being selfish, it is not a bad thing for us that the players are having a little bit of a rest, as long as they are fit for the summer. "The players obviously want to play every week and will be disappointed they are not fit. "But for us, looking at it, as long as he is fit closer to the tournament - if we are being ruthless - that is what we have to look at." Wales host Northern Ireland at Cardiff City Stadium before travelling to face Ukraine in Kiev four days later. Their final warm-up is against Sweden, in Stockholm on 5 June. Asked whether he knew his squad of 23 players for the tournament, Coleman said: "Yes - but I have picked it about 200 times. I tweak it every time. "I know really who I want to take, but I know this is football and things change quickly."